“A lot can happen over coffee“! Where would we be without our coffee shops? Love the neon. A lot can happen over coffee 😀 This is so true Madhu… even more so over a bottle or two of wine :O) Love your post idea! Us too Gerry, especially when we travel. Thanks for stopping by. Our coffee generally happens at the kitchen table with a gaggle of people. So much happens over it! Never a ruer word, Madhu! I like the pink and the warm colours, and the small, smiling faces. Nice photo, Madhu. I have a friend who I meet for coffee, it usually begins that way but then we linger and it becomes lunch and then afternoon tea! Not in Chennai. But Bangalore has one that looks exactly like the one in Kolkata! Thanks for the visit and comment Ron. Just popped over to your site and was bowled over by your photos! Will certainly return to browse through your portfolio. 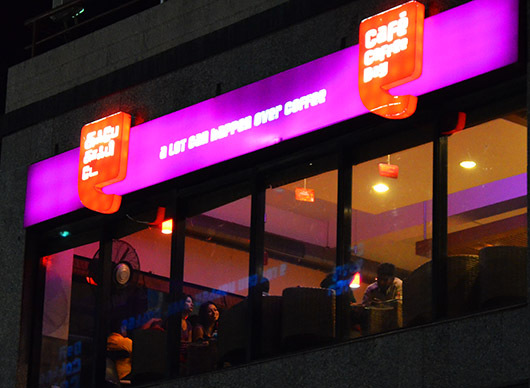 Bangalore’s India Coffee House on MG Road – I must’ve had so many coffees and dosas there during my college days – it was the best place to hang out and spend hours with friends. Madhu, you are taking me down memory lane…..
That’s a Cool Picture… It reminds me of New York City… I went there once, and my Dad and I ate at a McDonald’s that was on a Second Floor like that, looking down over Town Square… It was pretty Awesome. Thanks Fergiemoto 🙂 If only the quality of my photos could match yours…..